This particular landslip commenced behind what was then the Museum (today’s 159 William Street), breaking and cracking all the ground and structures that lay between Queen’s Wharf Road and the riverbank. The result was the upheaval of the recently completed Sanitary Plant and wharf, damage to the floor of the morgue, with loss of its verandah and jetty and loss of the old and damage to the new Queen’s Wharves. 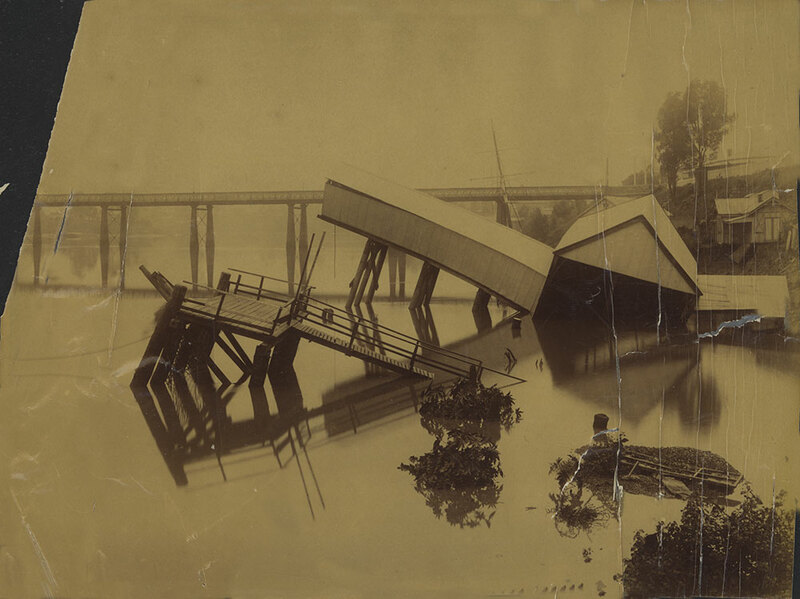 According to a report from the Brisbane Courier, the angle at which new Queen’s Wharf was positioned after the landslip ‘did not argue well for its safety’. Gangs of men worked quickly to save items under threat from further slippage. Gas and water pipes were made safe. The fittings from the morgue were rescued and the contents of the stone building previously used to house the luggage of immigrants, speedily removed. That this section of Queen’s Wharf is still capable of a slippery surprise was revealed in 2011 when a burst water main in William Street caused the collapse of the wall behind the Commissariat Store. Archaeological research conducted on the material which slipped revealed that it contained fill material, deposited when a repair to a wall above the Commissariat was made in the late 1880s. Brisbane Courier, 8 February 1890, p. 5.